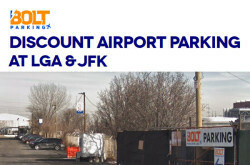 Bolt parking LGA and JFK international airport valet parking service in New York. 24 Hour Lot Attendant, Free round trip airport Shuttle, Shuttle Tracking, Camera Surveillance, 24 Hour Security, Discounted Rates, Satisfied returning customers. 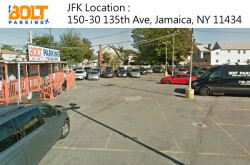 Address : 150-30 135th Ave, Jamaica, New York, NY 11434, United States. Outdoor Valet (Daily) online price : $15.99/day. 24 Hour Lot Attendant, 24 Hour Security, Camera Surveillance, Free round trip airport Shuttle 24/7, Shuttle Tracking, Discounted Rates. Outdoor Valet (Daily) parking online price : $11.99/day.